Answering the Interview Question: What’s Your Most Impressive Accomplishment? What’s Your Go-To Social Network for Finding a Job? Poll: How Do You Build Your Network Outside of Social Media? Santa Checks His List Twice; Have You Looked at Your Resume? Do Millennials Spend Too Much Time on Screens? Do you own a smartwatch, fitness tracker, or other technological device known as a “wearable?” If so, you’re not alone. In fact, according to Forbes, just under 50 million wearable devices were shipped in 2015. And in 2019, 125 million more are expected to be purchased. Millennials, the newest generation to enter the workforce, are known as technology-savvy. So, it’s no surprise that the majority of people (48%) who use wearable technology are part of this generation. And, 71% of younger workers want to own wearable tech if they don’t already. The technology behind these devices has been around for decades, but the greater availability of internet access has made them significantly more useful in recent years. If you’re considering investing in the trend, make sure you know when and how it’s appropriate to use your smart devices. Today, one in six consumers owns and uses wearable technology, which means these devices are becoming increasingly prevalent in the workspace. 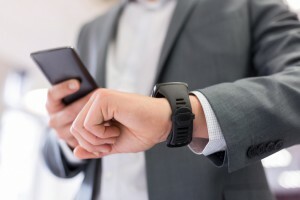 To take advantage of this growing trend, many companies have begun testing wearables for workplace security, time management, and communication purposes. Luckily for employers, early studies have proven the trend may pay off. According to the University of London, employees who own wearable technology reported an 8.5% increase in workplace productivity. Additionally, they experienced a 3.5% increase in job satisfaction. As the workplace shifts toward the future, many companies will begin integrating their internal systems with wearables. This means, they may use your wearable (or provide you with a company-owned device) to track your productivity and health. If you have a fitness tracker that records your workout and sleep patterns, your employer may be able to locate that information. This information could then be used to make changes in the workplace that improve your work experience and productivity. While there are benefits to this information sharing, it’s important to understand what information you may be giving your boss. If you’re going to wear your fitness tracker or smartwatch to work, take advantage of the data these devices provide by tracking your habits. Doing so may help you increase productivity and implement changes that will have a positive effect on your work. For example, if you notice you’re significantly less active between 2 and 4 p.m. every day, set a reminder to get up and walk around for a few minutes during this time period. You’ll be more active, alert, and healthy. During an important meeting, interview, or event, you wouldn’t look at your phone, right? The same applies to wearable devices. If you own a smartwatch and receive phone calls, emails, or text messages on your wrist, avoid the temptation to look when it’s not appropriate. Recruiters and potential employers will notice if you spend the majority of the interview checking your watch, and it may look like you’re in a hurry to leave. Don’t make the mistake of sending the wrong signals. According to a Workplace Options survey, 84% of workers age 18-29 report working two or more hours per day after their work day ends. They’re spending time on their mobile devices, checking email and making calls. As the rise of wearable technology continues, it’s easier than ever to stay connected to your workplace when you’re at home. Now, just a simple glance at your wrist could reveal emails or phone calls that prevent you from truly disconnecting. In fact, Ernst & Young reports that 24% of U.S. employees find it difficult to maintain work-life balance. Since work-life balance is essential to your overall health and happiness, don’t let your wearables upset that equilibrium. Do you own a wearable device? How do you stay productive in the workplace? Share your tips in the comments section below! Movin’ On Up is brought to you by Express Employment Professionals. © 2018 Express Services, Inc. All rights reserved.